Yup, I am now officially three days overdue. Baby Saunders seems to be quite content to stay right where he is. The doctor thinks that once things gets started that my labor will progress relatively quickly, but it is just a matter of the little guy deciding the time is right. Just in case he decides to continue being stubborn (now did he get this trait from his mommy or his daddy;)), we did schedule an induction for Wednesday December 5th. I was hoping we could do it a little sooner, but that was the earliest that the hospital could accomodate an induction that was not medically urgent. So we wait, but at least I can see the light at the end of the tunnel. 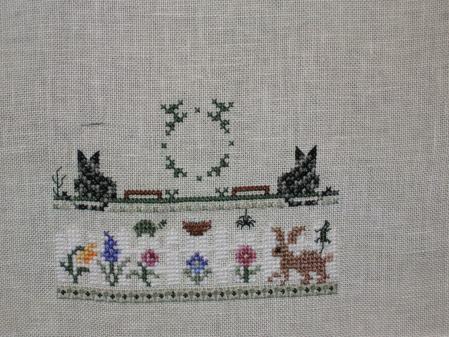 With my extra free time now that I am off work, but as of yet without a new baby, I have plenty of time for stitching. I have made some great progress on my rotation. After finishing my German Garden slot I did about 6 hours on Just Nan’s Baby Garden. It is coming along nicely. I started at the bottom with band ten and have now finished most of bands 7-10. After that the next slot in my rotation was supposed to be Brightneedles My Lady’s Needlecase, but I couldn’t find any good size 28 needles. I tried to work on it with a size 26, but it just wasn’t going anywhere over one on 32 ct fabric. Thus I tweaked my rotation a bit until I get my order from One Star’s Light that inculdes some petite 28s. So I decided to pick up Butterfly Rest instead and over the last two days I have really gotten into working on her. I can’t believe I haven’t worked on that piece for over a year. She really is a lot of fun:) I’ll show you a picture later today. I know you just want that baby NOW, but do try to enjoy the time you’ve got now. Get plenty of sleep and walk a lot. That should get things moving a little! I fell in love with Baby Garden as soon as I saw it in my LNS and had to buy it. This is my absolute favorite baby sampler. The fact that you get to add the time of birth as well as the date is so cool. Plus the little over one fish pond. I can’t wait to see your finish on this. Dec 5th sounds like a great Birthday but Dec 2, 3 or 4 would be good too. Enjoy your stitching time. Hi Leslie, just wanted to say that I’m thinking of you and your DH this week as you wait for the arrival of your baby – wishing you all the best. I too love Baby Garden and this is the sampler that I’ve decided to stitch myself:) I hope to start it in the new year sometime. YOur WIP is looking lovely! I hope baby Saunders arrives safe and sound! Great progress on Baby Garden – this one is so beautiful in person. I’m so glad I finished mine!